Top, Carnegiea gigantea with pollinators, in watercolor by Joyce Peters. Bottom, Peniocereus greggii fruits, in colored pencil by Margaret Pope. In keeping with the Sonoran Desert Florilegium Program’s goal to promote conservation and appreciation of Sonoran Desert plants through botanical art, a florilegium has been established to document plants native to the Sonoran Desert Region. Last month, a notable milestone was reached when the Program issued a call for entries for artists to submit works to the Sonoran Desert Florilegium. The submittal process is open to any artist, and in order to get the process started quickly, Margaret Pope recently met with a small group of artists from the Southwest Society of Botanical Artists (SWSBA) to explain the submittal process for the Florilegium. Information from that meeting is now being sent to all members of SWSBA. Submissions to the Florilegium must be two-dimensional works of botanical art, a requirement that excludes photography and digitally-created works. Plants selected for portrayal must be native to the Sonoran Desert. Works must adhere to a high standard of botanical accuracy and be reviewed by a botanist before submittal. The Call for Entries is on the Florilegium Program’s website. Artworks will be accepted into the Florilegium by a jury composed of a botanist, a botanical artist, an artist, and a member of the Steering Committee. Entries will be accepted twice a year, from July 1 to July 31, and from January 1 to January 31. Once accepted, these artworks will be displayed on the Florilegium’s website in a unique section designed to highlight the artwork, the artist, and the plants. As noted in the October 2014 issue of The Desert Breeze , the Sonoran Desert Florilegium is a digital project. Instead of curating a physical collection of artworks, the Florilegium Program will archive high-resolution digital images for online display with the possibility of future publication. Artists will retain copyright to their works but will grant to the Florilegium the right to use their images not only for website display but also for educational and promotional purposes and for any publication projects that may arise. One unique feature of the Sonoran Desert Florilegium is its inclusion of multiple representations of the same plant. For example, jurors may accept a pen and ink drawing of Datura wrightii, a colored pencil rendering of the plant, a watercolor portrayal, and a painting that shows a sphinx moth pollinating the plant. All versions are useful in fully documenting the plant. Artists may also choose to focus on a single aspect or structure of a plant, such as a flower’s progression from bud through fertilization. 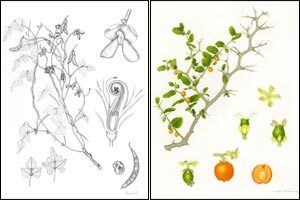 While a thorough documentation of a plant is best accomplished through a botanical plate (preferably in color), artists may be able to convey some of the same information about a plant in a less exacting format. 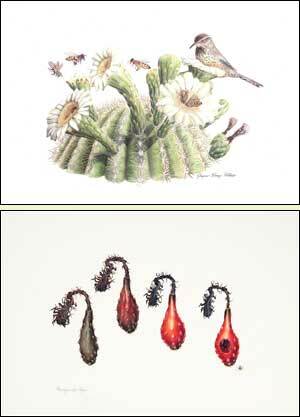 Shown here are three groups of images that illustrate the different forms of botanical documentation that would be acceptable in the Sonoran Desert Florilegium. 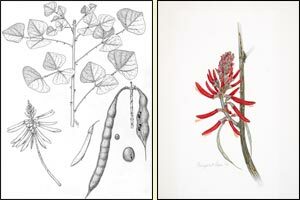 As the Sonoran Desert Florilegium expands its online collection, artists, scientists, and the general public can gain an appreciation of the scientific accuracy and aesthetic value of the art and an awareness of the unique and fascinating flora of the Sonoran Desert. This appeared in the April 2015 issue of The Desert Breeze, the monthly newsletter of the Tucson Cactus and Succulent Society.